The XMS3 8GB (2 x 4GB) 1333 MHz C9 Memory Kit from Corsair is a set of two 4GB modules designed to run at 1333 MHz clock speed. It is equipped with an XMS heat spreader that helps dissipate heat. The module runs at 1.5V for maximum compatibility with Intel and AMD platforms. 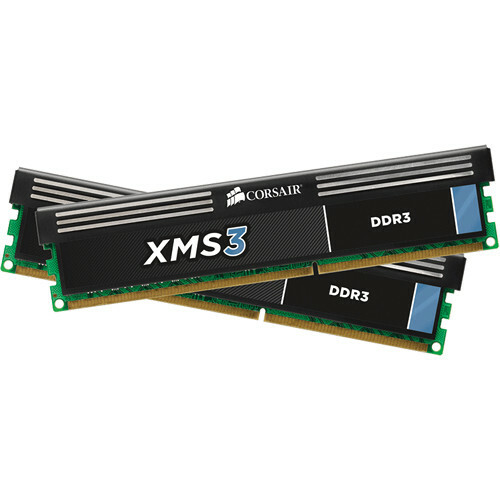 The XMS DDR3 memory offers fast and reliable DRAM for running resource-intensive programs. Selected ICs, tightly-controlled trace lengths, and an integrated heat spreader provide performance and stability. The XMS DDR3 memory is compatible with motherboards which have standard DDR3 DIMM memory sockets. It includes most PCs, with the exception of systems which require DDR4 memory. Box Dimensions (LxWxH) 6.0 x 5.3 x 0.5"
XMS3 8GB (2 x 4GB) DDR3 1333 MHz C9 Memory Kit is rated 5.0 out of 5 by 1.